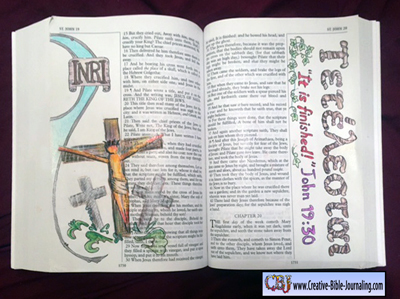 Follow Jackie Mattingly’s step-by-step directions to make this unique craft and stamp. 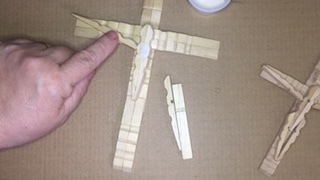 The size of your Crucifix will depend on the size of clothes pins you start with. 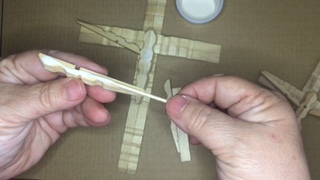 Your Crucifix will be a little smaller than 3 times the length of your clothes pins, a 1″ clothes pin will result in a 2-7/8″ Crucifix. 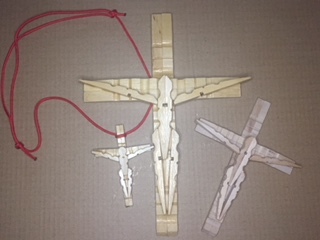 The Crucifix that I am using for an example started with clothes pins that are 1-7/8″ which resulted in a crucifix 5-1/4″ tall. 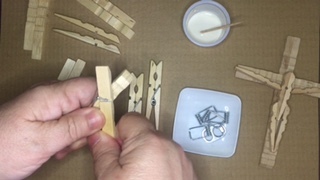 Separate the wooden sections of the clothes pins, twisting from side to side. 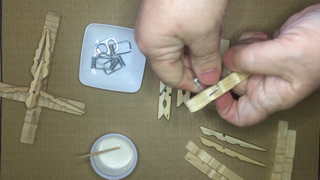 Discard the metal spring portion. 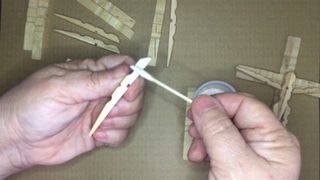 Glue together 5 pairs, side by side. 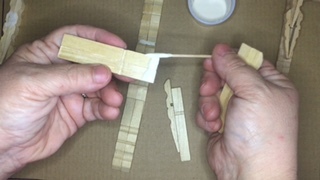 Glue 2 pieces, flat side together for the body. 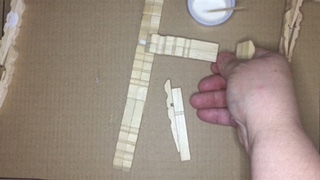 I also put glue over the little hole that will end up being in the middle of his chest. 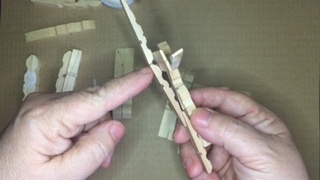 You should now have: 5 pair of 2 – side by side; 1 pair, flat sides together and 4 singles to use for the arms and legs. 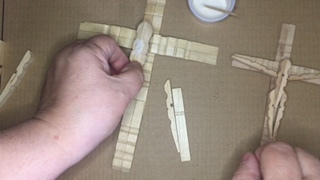 The top of the cross should be the thin edge of the pair. 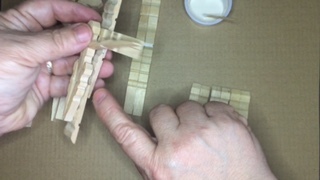 The middle section of the cross, the thicker edge, glues to the thicker edge of the top section. 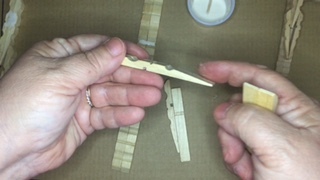 Lay the two pair of pins together fat end to fat end and glue. 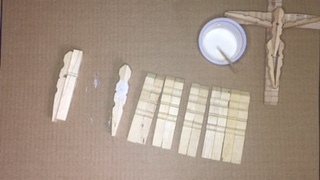 They will need to lay in position until the glue is dry. 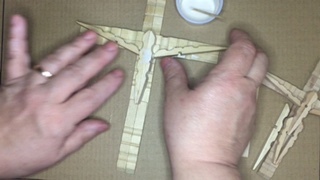 The thin end of the bottom section of the cross, overlaps the thin section of the middle section. 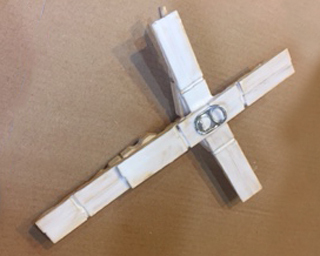 Make sure you overlap of the middle and bottom sections of the cross to leave enough room that the legs have a little room below the feet. 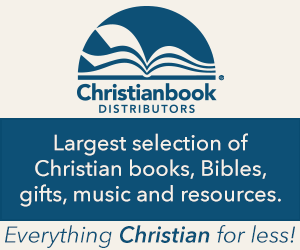 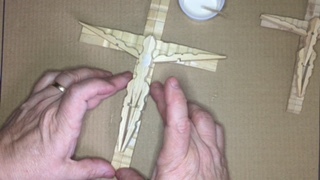 For the cross bars of the cross, the thin edge goes to the outside. 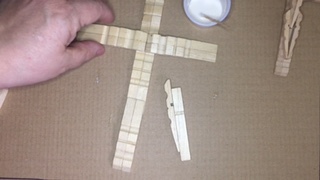 Use plenty of glue on the cross bars since that glue also secures the top and middle section of the cross. 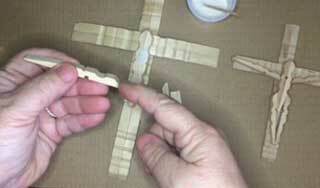 Put adequate glue on the body section. 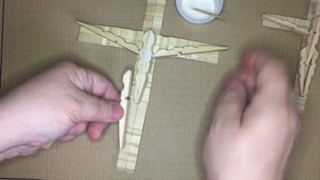 Place the head at the center of the cross bars. 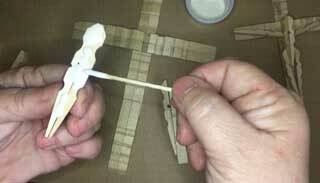 Put glue on the edge of the clothes pin that fits up against the body, as well as the back side of the arms. 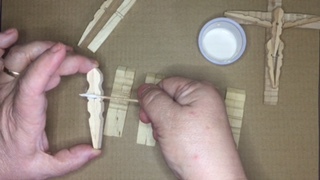 Make sure arms fit against shoulder and the hands remain over the cross bar. 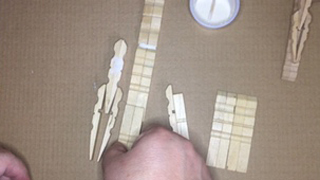 Repeat for placement of second arm. 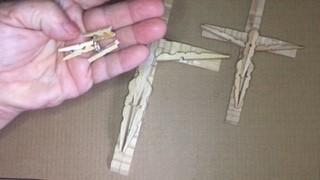 Position legs where the fat part of the clothes pin become his hips. 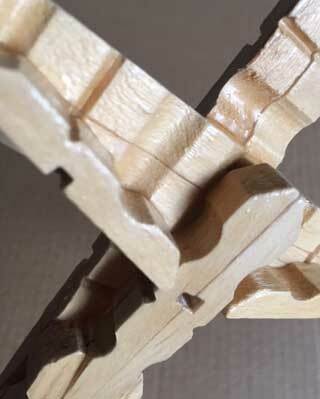 Repeat placement of second leg. 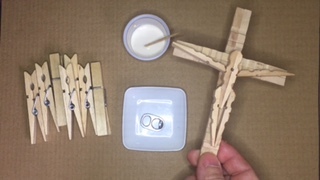 This step “could be” left off if you were going to move your Crucifix before it would have time to dry, but it definitely makes it look nicer and less likely to break. 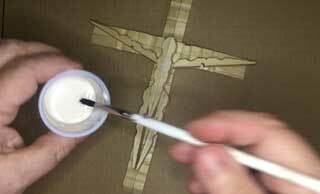 After your Crucifix has had a chance to dry, use a paint brush to put a heavy coat of wood glue over entire Crucifix. 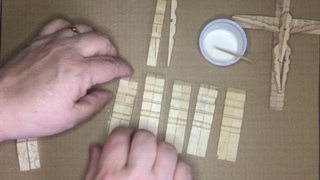 This coat of wood glue will help reinforce all of the joints. 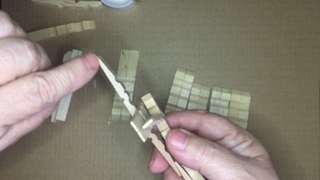 It should be as thick as possible without drips. 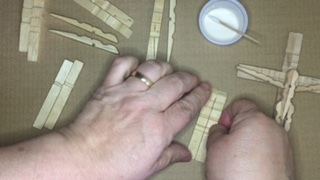 After the front has dried (overnight) put a heavy coat of glue on the back. 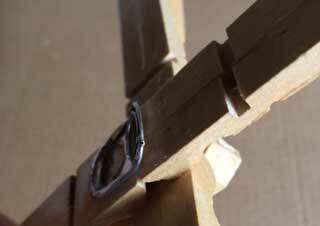 If you want to hang your cross on the wall, you can bend a soda pop pull tab and glue it on the back. 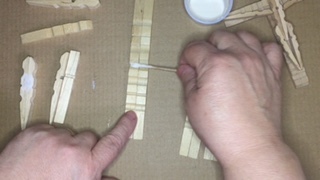 Make sure and use adequate glue on pull tab. 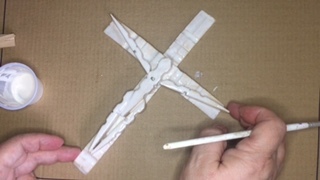 When the thick layer of glue dried it will be slightly shiny and will reinforce the structure of the Crucifix. 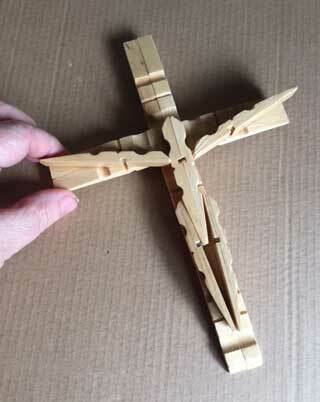 Using standard 2-3/4″ clothes pins, the dimension of my finished Crucifix is 8″ tall x 5-3/4″ wide. 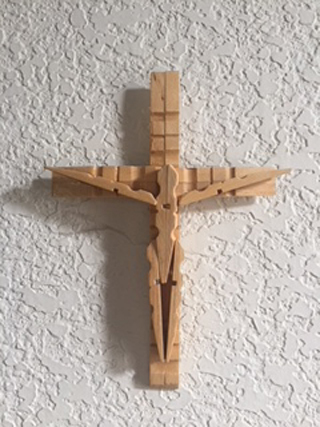 A very nice size to hang on the wall.